1000s of FREE Styles and MIDIs available in the Members Area for: KN7000 KN6500 KN6000 KN5000 KN3500 KN3000 KN2600 KN2400 KN2000 KN1600 KN1500 KN1400 KN1200 AC1200 KN1000 KN930 KN920 KN901 KN750 PR804 PR604 PR903/703/603 PR902/702/602 PR53 PR52 PR51 PR500 PR700 PR900 GA3 GA1 EA5 & More! KN7000 Styles for Your Technics Keyboard! 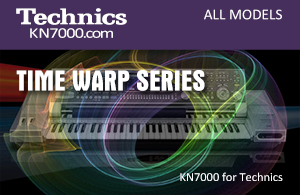 Our Time Warp Styles Series has 220 Technics KN7000 Styles, converted for you to play on your KN keyboard, Digital Ensemble and Organ. Technics keyboards are well-known for high quality sounds and features that were ahead of their time. Much of the information about these superb instruments ins disappearing but there are many happy owners out there and the aim of this site is to gather together as much information as possible about each model. We have two other websites dedicated to this fantastic keyboard. TechnicsKN7000.com is a close replica of the original Technics website put together when this arranger keyboard was released. KN7000.co.uk is geared towards using the KN keyboards with modern techniques such as Digutal Audio Workstations and also includes new styles for your keyboards. Do you own a Technics Keyboard or Organ? Over two and a half hours of music, including the full Carmina Burana! Click Here and Give Yourself a FREE Health Boost!